Los Angeles: As dismal as 2008 has been for solar stocks, next year doesn’t look any brighter. There is palpable optimism, however, that the new US presidential administration will move rapidly on legislation to boost demand for alternative energy sources. Still, it remains to be seen how quickly that would get done and what form it will take. “It will be a tumultuous year for most solar companies," said Karina Funk, an analyst with Winslow Green Funds in Boston. The WilderHill Clean Energy index, whose components include SunPower Corp., First Solar Inc., Suntech Power Holdings Co. Ltd and other solar companies, is down about 70% so far this year. That far surpasses the nearly 40% decline in the Standard & Poor’s 500 index in 2008. 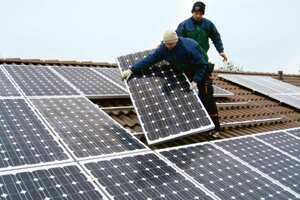 The gloom over solar stocks followed a sharp run-up in 2007 as investors banked on increased concerns about climate change and rising oil prices to spur demand for clean energy sources. Those trends still make solar a good long-term bet, say analysts, who also expect the weakened global economy to shake out an industry that has scrambled to ramp up new production lines and factories in recent years. “We need to see some folks go bankrupt," said Wedbush Morgan analyst Al Kaschalk. “There is too much in the marketplace, and too much noise. I wouldn’t be surprised to see folks as they come out of Q4 looking a little less stable." Large, well-funded US players such as Energy Conversion Devices Inc., SunPower and First Solar will survive the turmoil, added Kaschalk. Winslow’s Funk also said she favours energy conversion devices, the maker of thin solar products that can be integrated into buildings, and First Solar, which does not use the high-priced polysilicon that dominates the industry in its panels, because their technologies set them apart from rivals. Even before the dramatic tightening of credit markets and broad market turmoil, investors had cooled to solar after a pull-back in Spanish and German government subsidies that threatened to leave the fast-growing market awash in solar panels next year, driving down prices and profit margins despite overall global demand growth. In recent weeks, the prospects have dimmed as tight access to credit clouds the demand picture. The world’s largest solar cell maker, Q-Cells SE, recently cut its outlook and said the solar market would stay subdued well into 2009. That announcement has been followed by revenue warnings from companies all along the solar supply chain. Chinese solar cell maker JA Solar Holdings Co. Ltd, US solar installer Akeena Solar Inc., and MEMC Electronic Materials Inc., which makes the solar industry’s key raw material, polysilicon, have all revised their sales outlooks for the current quarter. In its statement on 17 December, MEMC said a lack of available credit had limited customers’ purchasing ability. Solar projects typically attract investors who specialize in making so-called tax equity investments, collecting the federal tax credits on the income from the project to help offset taxes on their other income gains. This year, market turmoil means few investors will have large tax liabilities that need to be offset. “The big uncertainty is what the traditional parties who finance large solar projects are going to do," said Michael Hindus, an energy attorney with Pillsbury Winthrop Shaw Pittman Llp. in San Francisco. “That pool may shrink." The recent eight-year extension of federal tax breaks for solar projects was boon to the industry, he added, though he said much more is needed. “It’s what we lawyers would call ‘necessary but not sufficient’," Hindus said. Favourable US policies towards renewables that would help unlock investment are widely expected to be implemented by President-elect Barack Obama early next year, though he has yet to lay out specific plans. The US solar trade group, the Solar Energy Industries Association, has called on the new administration to create tax incentives for solar manufacturing plants, pass a federal mandate requiring utilities to source a percentage of their electricity output from renewable sources, and to improve access to federal lands to build solar power plants. “They’ve done a pretty good job of keeping very quiet," Funk said of Obama’s team. “We don’t know if it’s going to happen in 30 days or 180 days—and what it’s going to be." Still, Piper Jaffray analyst Jesse Pichel told clients on 17 December that the sector could rally ahead of Obama’s inauguration, saying the sector will also be boosted by a weakening dollar, increased solar financing from German state bank KfW, and a plan by the European Union to draw 20% of its power from renewables by 2020.